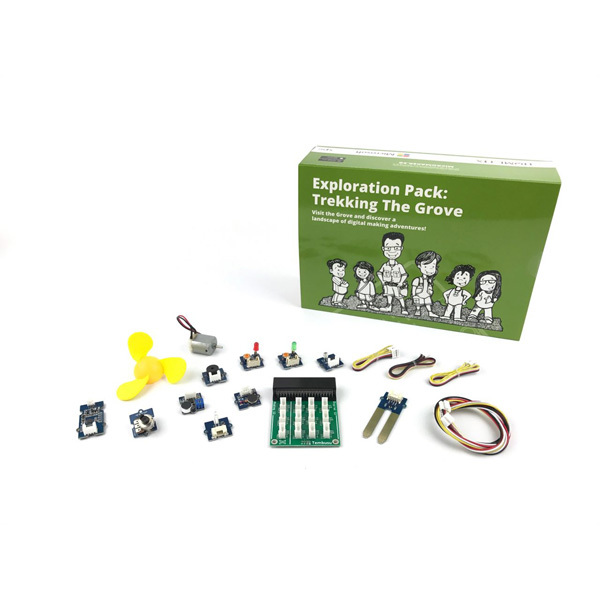 All the components you need to embark on a journey to discover a landscape of digital making adventures! The digital makers take the next steps after they have set up their basic camp and got things going. They aim to level up on their basic making to make their castaway life a little more comfortable. Some of them start foraging near their base camp and the remains of their boat to see what useful stuff they can salvage. It’s literally a treasure hunt where the best stuff isn’t gold or jewels but stuff like cardboard and wood! Grove Sound Sensor : Connects to analog output. Based on the LM358 amplifier and electret microphone. Used to detect sound strength of the environment. Grove Rotary Angle Sensor: Produces analog output between 0 and VCC. The angular range is 300 degrees with linear change in value. Mini Fan (DC motor) : Connects output to a DC motor. Turn on when pin is turned to high. Light Sensors : Detects level of ambient illumination to trigger light brightness.